John Tyas joined The Times as a reporter in 1817. In August, 1819, Thomas Barnes, the editor of The Times, decided to send Tyas to cover the parliamentary reform meeting at St. Peter's Field. Tyas was chosen because according to Barnes he "was nephew to an individual of great respectability in the town of Manchester"
Whereas the other journalists that covered the St. Peter's Field meeting worked for local newspapers, Tyas was based in London. 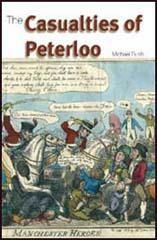 The Times had been critical of the parliamentary reform movement and there is no evidence that Tyas was a radical sympathizer before the Peterloo Massacre. Tyas and the other journalists at the meeting were positioned on the platform with the speakers. As a result, Tyas was arrested with Henry Hunt, Joseph Johnson and John Saxton when the meeting was broken up. Thomas Barnes was furious that one of his journalists should be arrested. As Tyas was unable to send his report, The Times published an account written by John Edward Taylor, a journalist who worked for the Manchester Gazette. 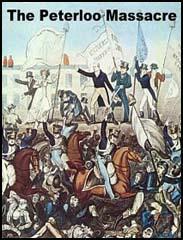 Although Taylor was not a radical, he was outraged by the Peterloo Massacre and the article was very critical of the authorities. After John Tyas was released from prison, his full account of the events was published on 19th August. The Times mounted a campaign against the action of the magistrates at St. Peter's Field. In one editorial the newspaper told its readers "a hundred of the King's unarmed subjects have been sabred by a body of cavalry in the streets of a town of which most of them were inhabitants, and in the presence of those Magistrates whose sworn duty it is to protect and preserve the life of the meanest Englishmen." As these comments came from an establishment newspaper, the authorities found this criticism particularly damaging. (1) In his account in The Times published on 19th August, 1819, John Tyas described how the reformers arrived at St. Peter's Field. The place appointed for the meeting was a large vacant piece of ground on the north side of St. Peter's Place. About half-past eleven the first body of Reformers arrived on the ground, bearing two banners. The first bore upon a white background the inscription of 'Annual Parliaments and Universal Suffrage'; on the reverse side: 'No Corn Laws'. The other bore on a blue background the same inscription, with the addition of 'Vote by Ballot'. Shortly afterwards a dung-cart was brought, into which the standard bearers were ordered to mount, and from which all the standards arrived afterwards were displayed. Numerous large bodies of Reformers continued to arrive from this time to one o'clock, from the different towns in the neighbourhood of Manchester, all with flags, and many of them drawn up five deep, and in regular marching order. A club of Female Reformers, amounting in numbers, according to our calculations, 150 came from Oldham; and another, not quite so numerous, from Royton. The first bore a white silk banner, by far the most elegant displayed during the day, inscribed 'Major Cartwright's Bill, Annual Parliaments, Universal Suffrage, and Vote by Ballot'. The females of Royton bore two red flags, the one inscribed 'Let us die like men, and not sold like slaves'; the other 'Annual Parliaments and Universal Suffrage'. The Radicals of Saddleworth brought with them a black banner to the field, on one which was inscribed 'Taxation without Representation is Unjust and Tyrannical; Equal Representation or Death'; on the other side, 'Union is Strength - Unite and be Free'. The Reformers from Rochdale and Middleton had two green banners bearing the inscription, 'Hunt and Liberty'. By one o'clock 80,000 people were assembled on the ground. A young lad, not more than seventeen or eighteen, was addressing the meeting with great vehemence of action and gesture, and with great effect, if we may judge from the cheers which he every now and then extracted from his audience, who were now beginning to be impatient for the arrival of Hunt. The Reformers who had up to this time arrived in the field demeaned themselves becomingly, though a posse of 300 or 400 constables, with the Boroughreeve at their head, had marched in a body into the field about 12 o'clock, unsupported by any military body. Not the slightest insult was offered to them. A group of women of Manchester, attracted by the crowd, came to the corner of the street where we had taken our post. They viewed the Oldham Female Reformers for some time with a look in which compassion and disgust was equally blended, and at last burst out into an indignant exclamation - "Go home to your families, and leave sike-like as these to your husbands and sons, who better understand them." The women who addressed them were of the lower order of life. We had waited up to one o'clock on the field of action for the arrival of Mr. Hunt; but as he had not made his appearance, we determined to go and meet the procession. We met it just by the Exchange, where the people were cheering most loudly, and Hunt and Johnson joining in the cheers. They were seated in the open landau along with Carlile, Knight and others, and moved in grand procession from Smedley Cottage, past New Cross and Shude Hill, preceded by a large body of male, and followed by scarcely less numerous body of female Manchester Reformers. (2) John Tyas provides one of the best accounts of how Henry Hunt and the other leaders were arrested. His account appeared in The Times on 19th August, 1819. I saw the Yeomanry Cavalry advancing in a rapid trot to the area. They were in disorder, and on arriving within it, they halted to breathe their horses, and to recover their ranks. A panic seemed to strike the persons at the outskirts of the meeting, who immediately began to scamper in every direction. After a moment's pause, the cavalry drew their swords, and brandished them fiercely in the air: upon which Hunt and Johnson desired the multitude to give three cheers, to show the military that they were not to be daunted in the discharge of their duty by their unwelcome presence. This they did, upon which Mr. Hunt again proceeded. This was a mere trick to interrupt the proceedings of the meeting; but he trusted that they would all stand firm. He had scarcely said these words before the Manchester Yeomanry cavalry rode into the mob which gave way before them, and directed their course to the cart from where Hunt was speaking. Not a brickbat was thrown at them - not a pistol was fired during this period: all was quiet and orderly, as if the cavalry had been the friends of the multitude, and had marched as such into the midst of them. The Manchester Yeomanry wheeled round the waggons till they come in front of them, the people drawing back in every direction on their approach. After they surrounded them in such a manner as to prevent all escape. The officer who commanded the detachment went up to Mr. Hunt, and said, brandishing his sword, "Sir, I have a warrant against you, and arrest you as my prisoner." The military officer then proceeded to say that he had a warrant against Johnson. Johnson asked for a civil officer, upon which Mr. Andrew came forward. As soon as Hunt and Johnson had jumped from the waggon, a cry was made by the cavalry, 'Have their flags'. They immediately dashed not only at the flags which were in the waggon, but those which were posted among the crowd, cutting most indiscriminately to the right and left in order to get at them. This set the people running in all directions, and it was not until this act had been committed that any brickbats were hurled at the military. From that moment the Manchester Yeomanry Cavalry lost all command of their temper. Saxton, of the Manchester Observer, was standing in the cart. Two privates rode up to him. "There", said one of them "is the villain Saxton; run him through the body." "No," replied the other, "I had rather not - I leave him to you". The man immediately made a lunge at Saxton, and it was only by slipping aside from the blow that his life was saved. As it is, it cut his coat and waist coat, but fortunately did him no other injury. A man within five yards of us in another direction had his nose completely taken off by a blow of a sabre. Looking around us, we saw a constable at no great distance, and thinking that our only chance of safety rested in placing ourself under his protection, we appealed to him for assistance. He immediately took us into custody, and on us saying we merely attended to report the proceedings of the day, he replied, "Oh! You then are one of their writers - you must go before the magistrates." He took us to the house where they were sitting. Just as we came to the house, the constables were conducting Hunt into it, and were treating him in a manner in which they were neither justified by law nor humanity, striking him with their staves on the head.